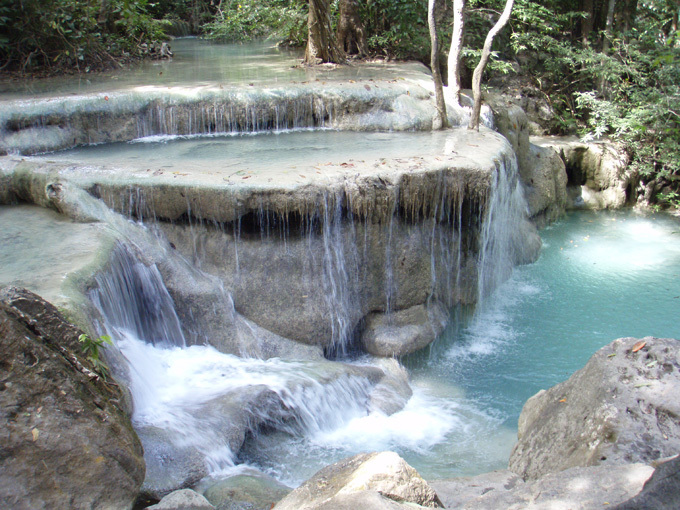 We drove from Erawan almost straight down to Bang Poo. We thought that this might be a nice little seaside resort to spend a day, before heading to the airport, but, like its name, it’s not that appealing …. maybe if you get to know it? Struggling to find a place to park (there is no beach, just mangrove swamp and a long pier with a restaurant at the end), we found another temple and made it our home for the night. After the cool silent nights in the National Park it was hard to sleep at near 30 degrees C and with a massive pack of dogs howling through the night. We think that a night in a hotel by the airport is in order for tomorrow! We’ve decided to have a little break from daily posts for a couple of weeks while the boys are here. 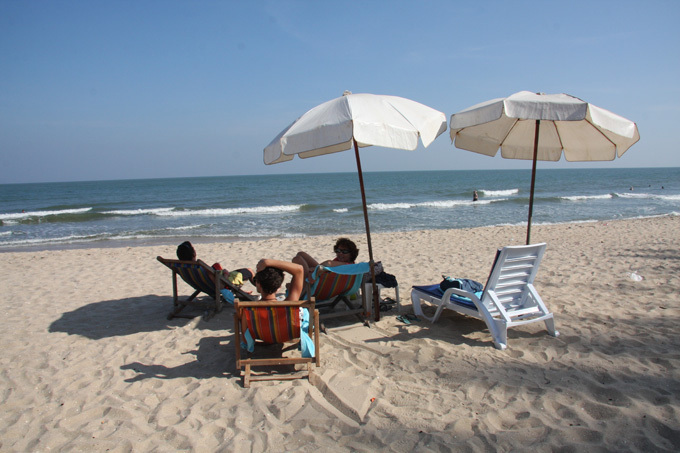 Two reasons, firstly that we think the content is getting a bit boring now that we are visiting the more accessible places, and secondly we need a rest from it. That is not to say that we will not post some pictures or highlights from the next two weeks, just that it will not be done for every day. We will resume the daily account once we head down to the Malaysian border and on to Kuala Lumpur and Port Klang for shipping. Night time temperatures here are great. Only 14 deg C last night … positively chilly! We’ll enjoy it while we can as we know that when we get back to Bangkok to pick the boys up at the airport it will be 32 during the day and 24 or 25 at night. Even on this busier site, there are only about two other tents and us now the weekend is over. We have a nice place to stay with lots of space. 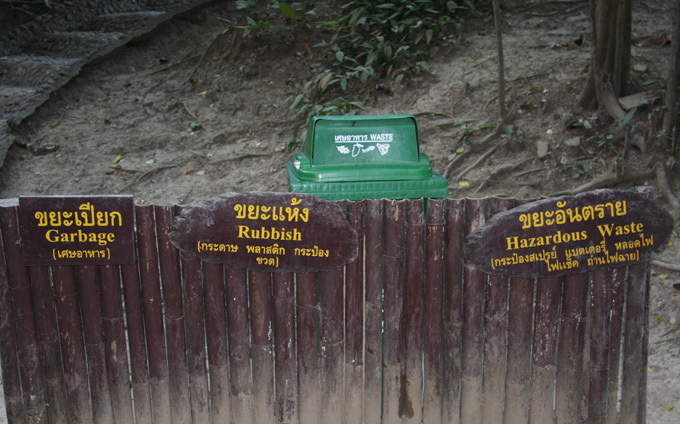 Walking back up to the falls, we could not help smiling at the signs on the litter bins. Great that they have all the categories listed, but in any case it goes into one bin! Why anyone would bring hazardous waste on a picnic is a mystery to me though. 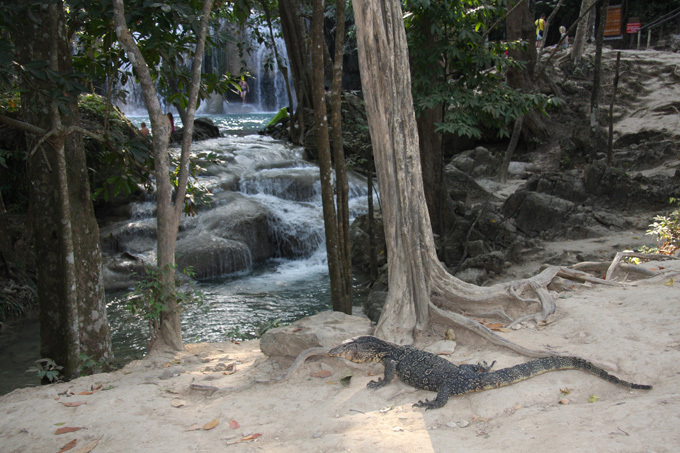 As we got closer to the 2nd tier fall we saw a monitor lizard head to the water. A brave dog tried to nip its tail as it swam into the main pool. It was a fast swimmer and we watched it chase the fish. It then swam into the main pool and this meant that we could take a picture without the swimmers in it. 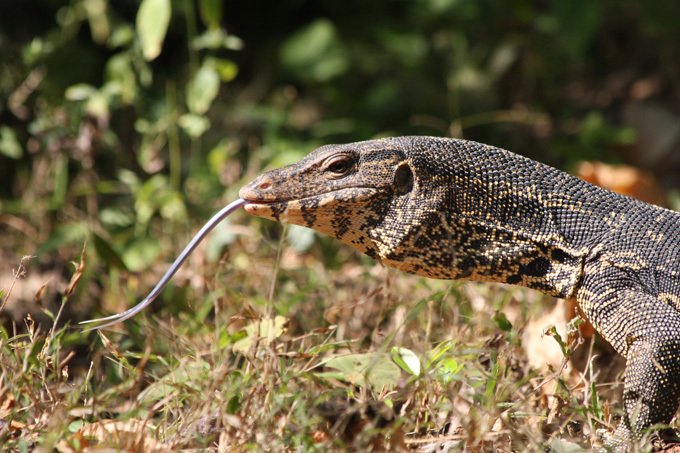 When we got back to our camping spot a big monitor lizard (more than a metre long) was walking past the camper. This time we had the zoom lens and a better background, and so could catch it with its tongue out! 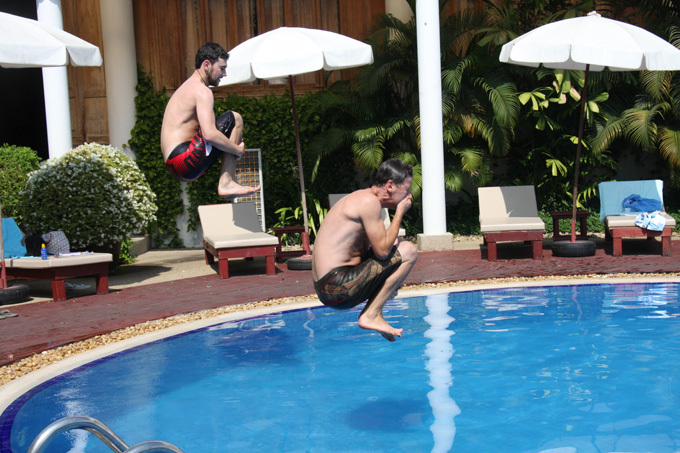 Tomorrow we head towards Bangkok, ready to pick Tom and Ben up, it will be great to see them! The weather is still cool and so we decided to stay around the camper and do a bit of car maintenance. Marjool worked on some of the business admin including the vat returns. While we were there an English teacher called John dropped by on his way home and said that he would like to use the website as material to help train the other teachers in the school English. He has picked travel as the background topic, so it may work! Good luck John! Work done we decided it was time for a swim. Getting through the fish at the edge of the pool is strange. They bump against you and the very small ones nibble skin. No wonder nobody stays in ages! 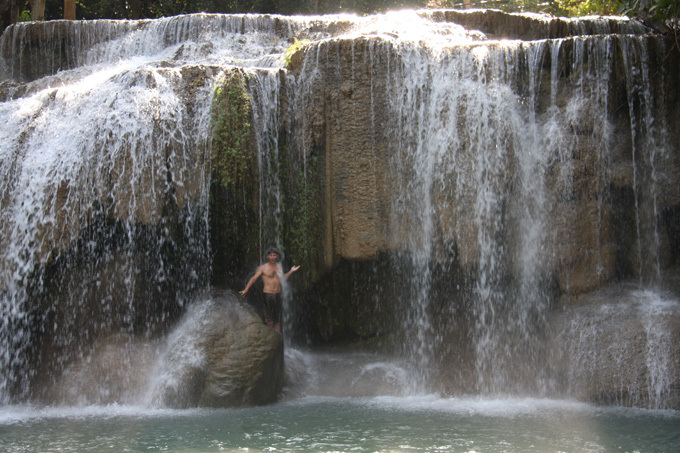 There are not so many places in the world where you can swim through warm water to a waterfall and then climb in behind the falling water. It is an amazing place. 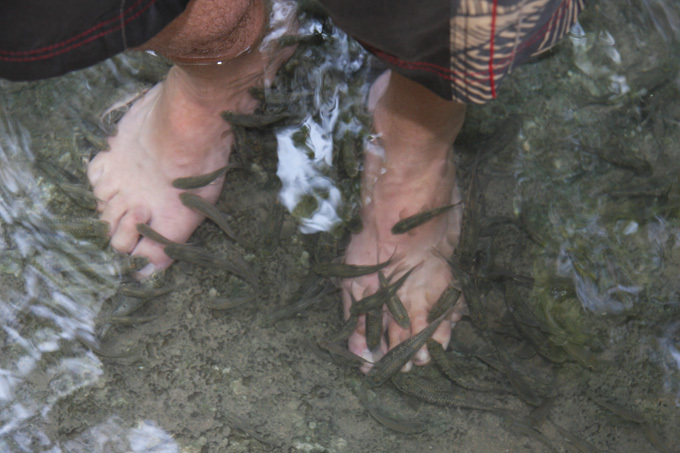 We also wanted to have the fish nibble the dead skin off our feet …. it took some time before you could let it happen. The nibbling really tickles and hurts slightly. After a while it feels good in a slightly painful sort of way …..!! When you are swimming, if you don’t keep moving the nipping starts. Still loving it here, maybe just one more day! The campsite here is great, and because it is the equivalent of a bank holiday weekend it is busier than any other camping area we have been to so far. Normally we like quiet but this makes a nice change, and we know come Monday afternoon everyone will be off again. 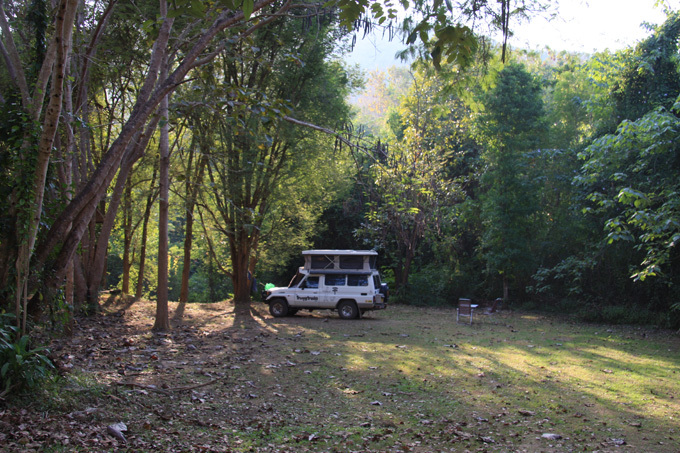 Camping is just starting to take off in Thailand and the way it works here is that you roll up to the campsite with just your food, and tell the little campsite office what sort of tent you want. These are already erected and are just carried by four people to where you want to camp. Mats, sleeping bags and cooking equipment are all hired for very small fees. 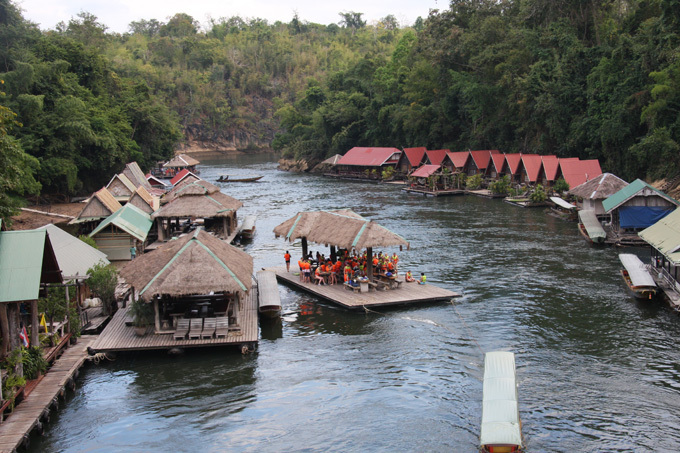 As we are in the camper we just pay 30 baht per person per night (60p). 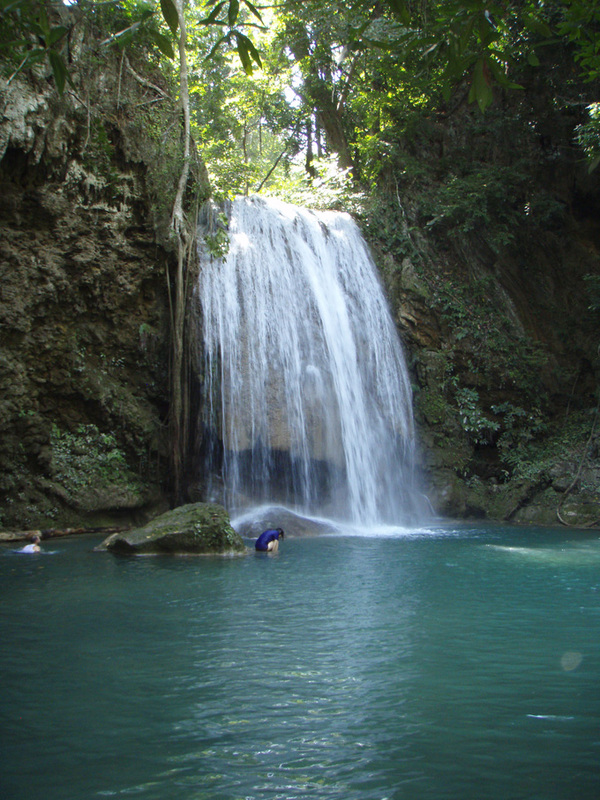 There are good showers, toilets and it is only a short walk to the falls and is right next to the river. It has cooled down over the last couple of days and is around 27 C during the day and 15 C at night. We love it but the locals are wrapping up in fleece jackets and complaining about the cold! 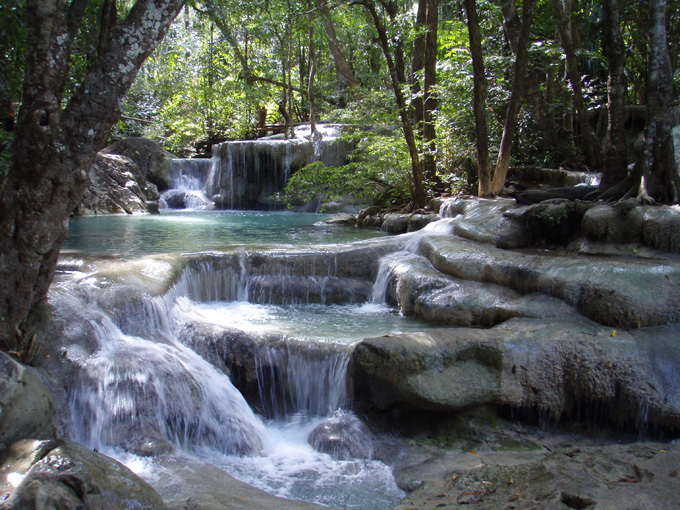 The waterfalls are beautiful, almost too perfect to be natural. We walked up to the top level (7) and took a few pictures on the way. It is a steep climb with steps and roots, but well worth the effort. 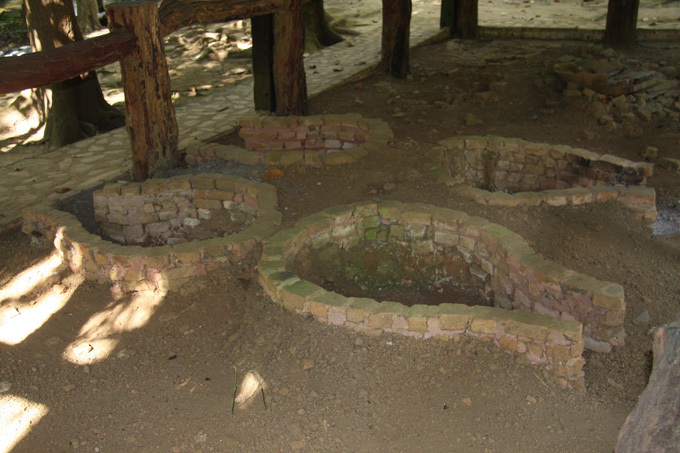 The calcium in the water forms level lips to the pools, making a step like structure. As you walk up the trail you see large trees that have escaped the general clearing of the hardwood forests from the 50’s onwards. 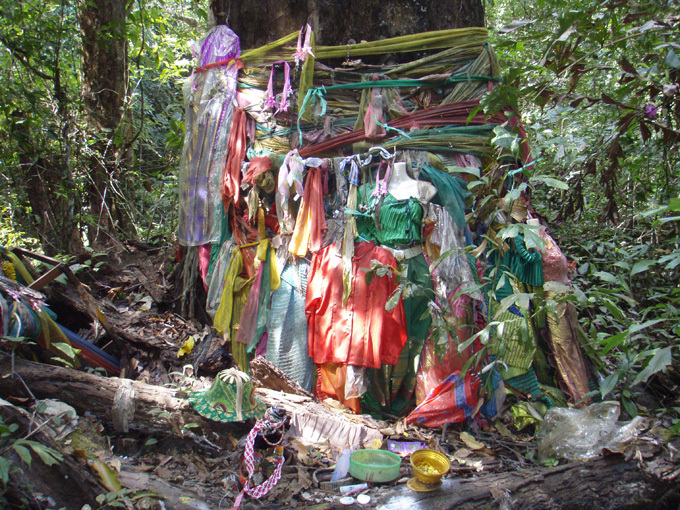 Locals put their hands together with a short prayer as they pass and the trees are decorated with all sorts of offerings. The path is closed at 4.00pm to give people time to get down before dark. 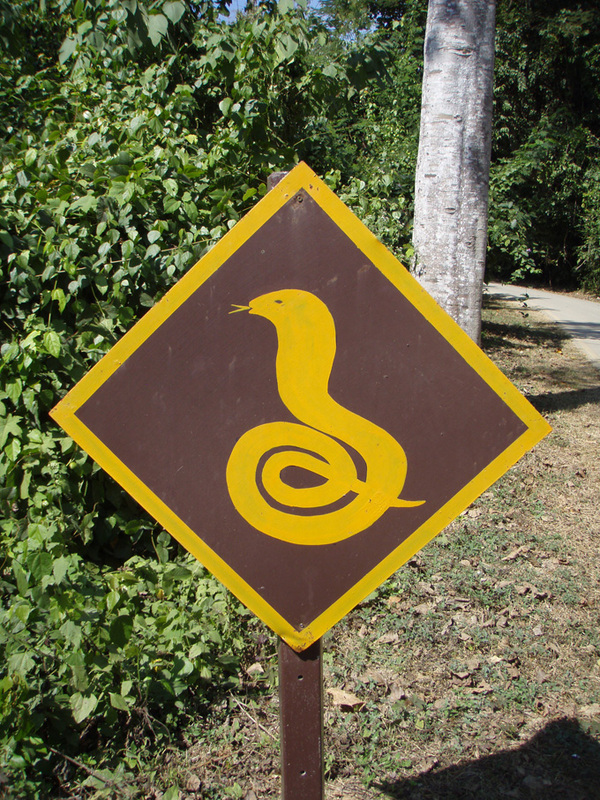 Firstly because it is steep with lots of trip hazards, but secondly there are lots of snakes in the jungle and they are more active at night. We are not sure how long we will stay here, but neither of us are keen to move on. 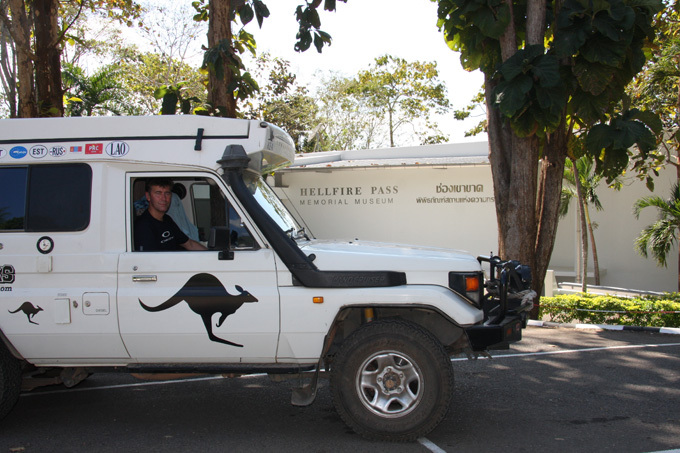 We left Sai Yok National Park first thing in the morning and drove down the 323 south east towards Kanchanaburi stopping on the way at the Hellfire Pass Memorial and Museum. 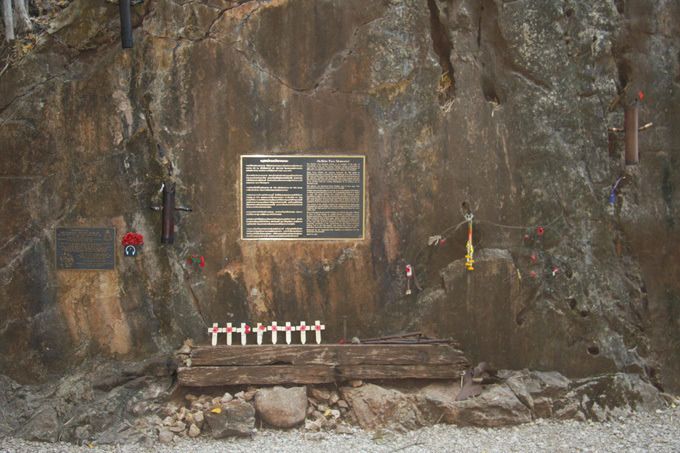 This memorial has been masterminded by the Australians as many perished here during the building of the Thailand – Burma railway during the Second WW. 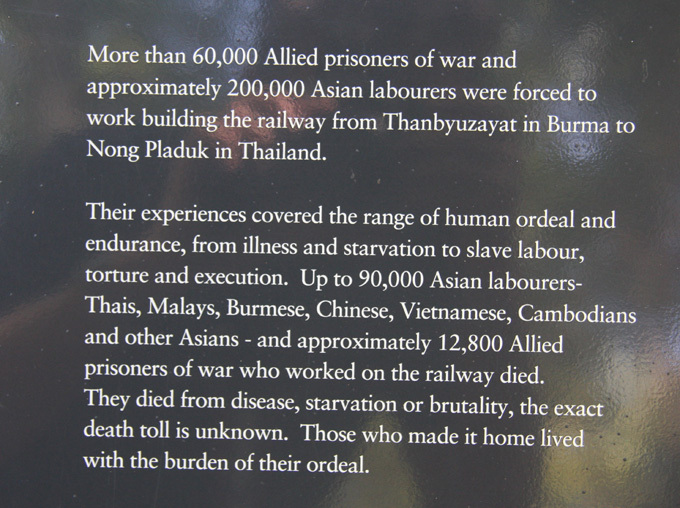 There were also many English and Dutch POW’s who lost their lives. 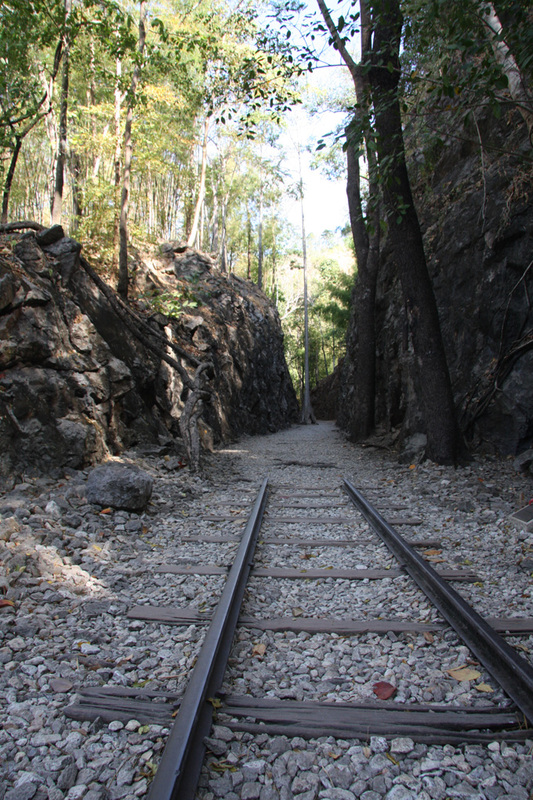 There is a Museum and visitors area where you can pick up an audio tour and the start of the walking track that follows the route of the so called ‘Death Railway’ for about 3km. It is excellent and well worth a stop. The scenery is stunning, but as you walk along listening to accounts of the prisoners on the audio tape, you can’t help but be deeply moved. 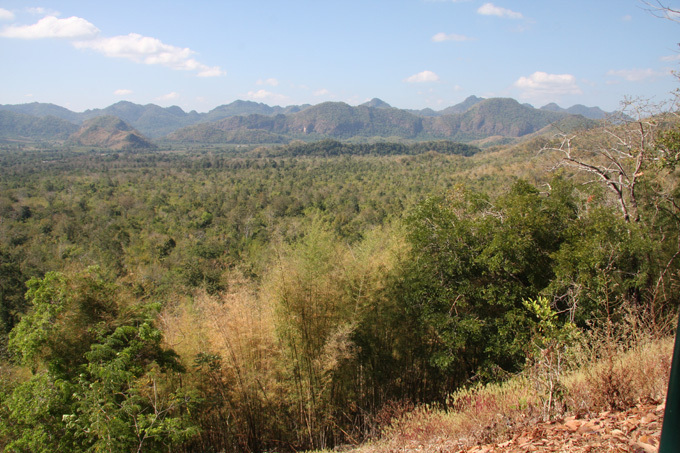 Hellfire pass itself is over 600m long and at its deepest it is 25m. It was all cut and cleared by hand at huge cost in terms of human life. We completed the walk to the end of the track and back (about 5km) during the morning. Even then it was very warm by the time we got back. It is not flat as there are a number of gulleys to cross that would have had wooden trestle bridges. Now it is steps down and then up again. After leaving the site we stopped for lunch at a typical roadside restaurant. 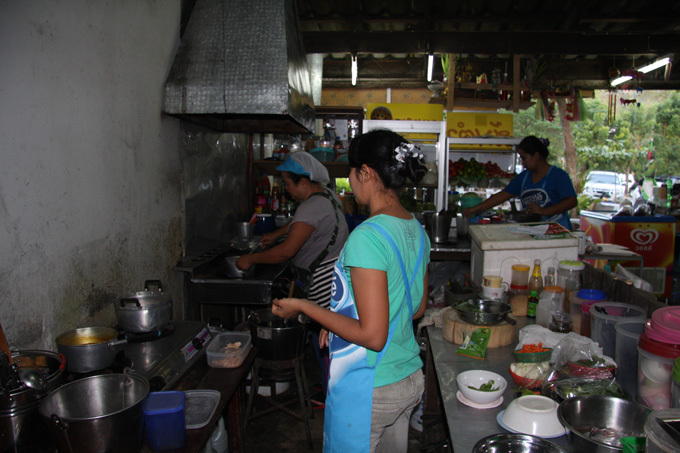 The kitchens are very simple but the food is always fine. Here are a couple of examples. 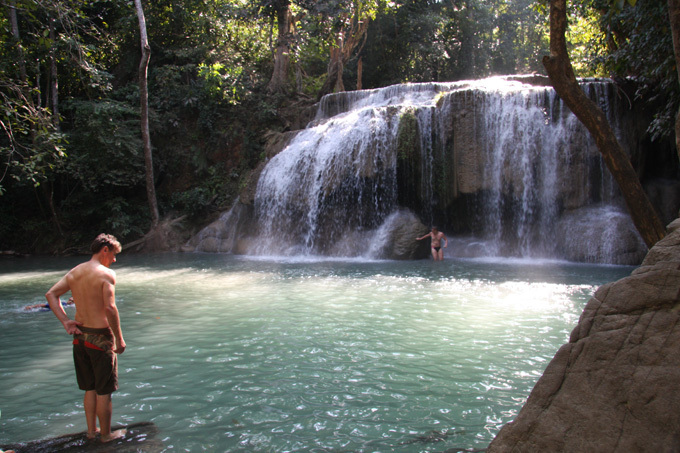 We arrived at Erawan National Park at about 3.00 pm, in time to walk up to the first waterfall and pool. It was very busy as the children are off school for a long weekend. 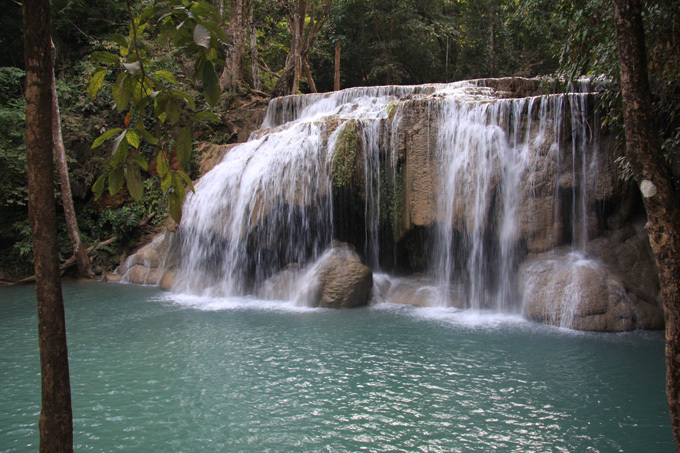 There are 7 main falls in total, most of which will be much less busy. We will have a look tomorrow. 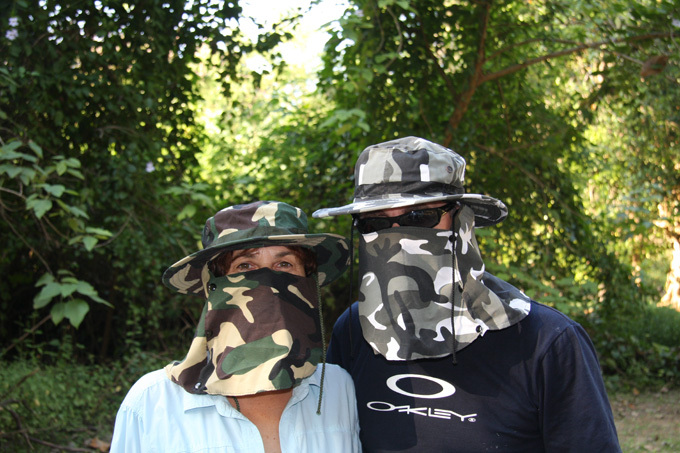 Last task of the day is to try on our strimming hats that we bought for 50 baht! Pretty scary! 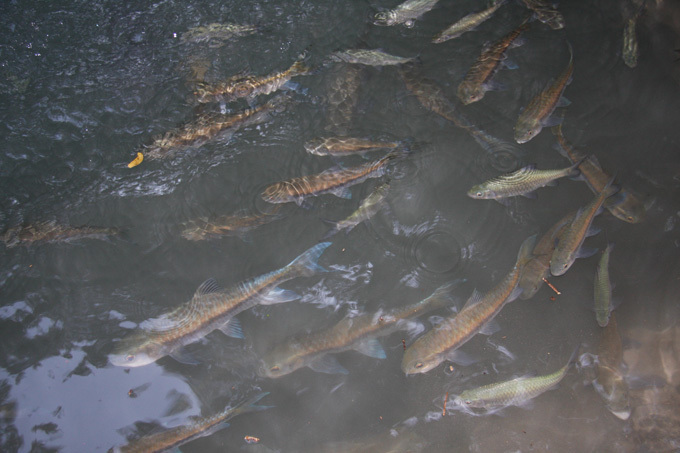 Marjool is slightly concerned about swimming in the pools under the falls as they are full of fish that love to nibble the old dead skin off your feet and legs…… hopefully it is not these. Spent another day in the park as it seems cooler here and we have a nice shady camping spot. There are lots of short walks around the park which are best done early before it gets too warm. 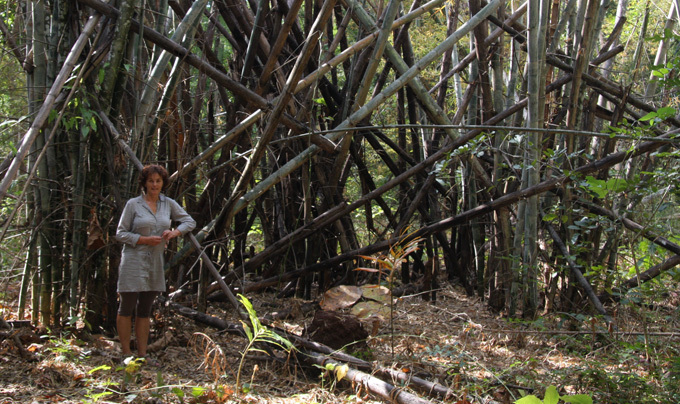 Lots of the trails are through bamboo …. big bamboo! 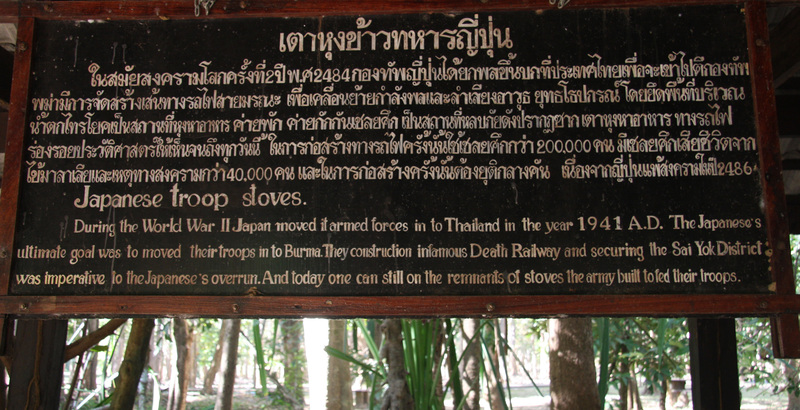 On the way back there are remains of Japanese camps used to hold troops ready for a push into Burma. 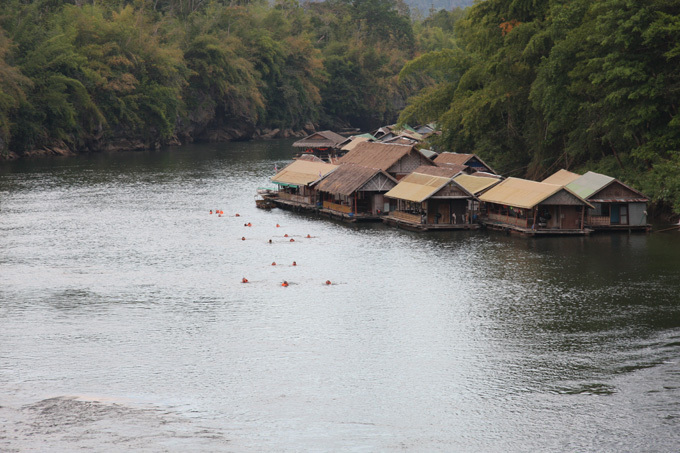 In the afternoon we watched as groups of tourists were taken up the river on floating pontoons, towed by long tailed boats, so that they could swim down with the current. The tourists were mainly Russians. You can tell because only the Russians walk about along roads and paths to the river with the men wearing speedos and the ladies bikinis and shoes with heels! They are not shy! 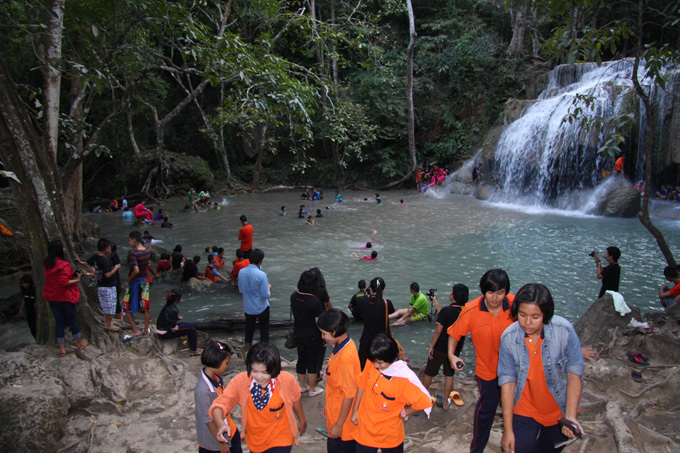 Its quite a contrast with the modest Thai people who always wear clothes that cover their bodies when they swim. On the way back to the camper we passed the stream that feeds the falls. It really is pretty. Last task was to cool down and wash before bed. 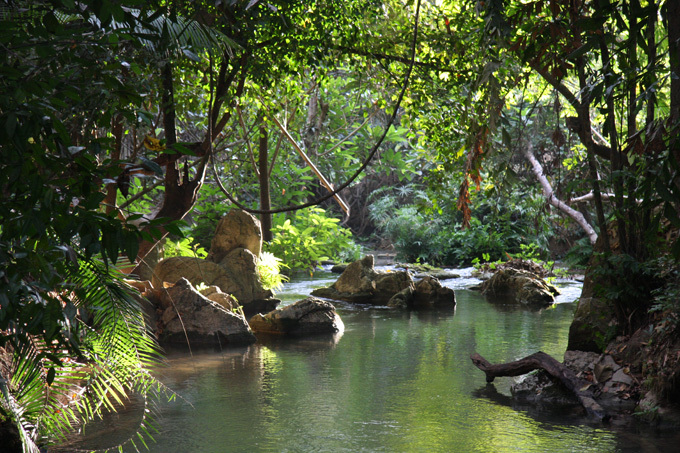 The stream is the perfect temperature. It was a cool night last night and even needed a blanket in the early morning rather than just a silk sleeping bag. Lovely.